Congratulations to Lynda Fishman on her notable memoir. Her recall of so many details of her past is impressive. Throughout the book we are reminded of how precious life is, that it can be snatched away in a moment and our world changed forever. The book is also about the importance of love and support from family and friends in the time of tragedy and sorrow. The last few chapters are devoted to Lynda’s fascination with the occult. This is displayed by many sessions with a medium in an attempt to contact “the other side”. She wanted so much to know that her mother, sisters and other deceased family members were alive and happy in another realm. She came to believe that they guided and protected her. The book is for everyone who delights in true-life accounts of triumph over tragedy. 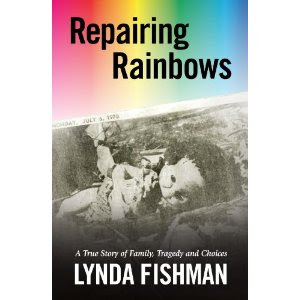 Lynda Fishman has succeeded in repairing rainbows in her life. For more information on this book, visit www.repairingrainbows.com. Disclosure: Thanks to Alina Goldstein for sending me this book for review. I was not compensated in any other way, nor told how to rate or review this product. Holy cow! That sounds like some story. I find the cover kind of creepy too. I am finding it hard to express my thanks to Lynda Fishman for putting her words on paper and writing this incredible book. It is the only book ever, that I have read twice. I lost my son in a tragic car accident few months ago and the words I could only feel and not express were in front of me.And every day, I say to myself that yes - we have choices and yes - I choose life. You have read this book whether you are experiences the aftereffects of tragedy of not. Love you Lynda and thank you form the bottom of my heart! There is one word to describe this book, inspirational. This story takes you on a rollercoaster through one woman’s life experiences of both tragedy and happiness. Lynda Fishman shows just how strong of an individual she truly is and has inspired me to go through life always looking on the bright side of things, even when life surprises you with the unexpected. After reading the book I gained a whole new perspective on life and I am so thankful. Lynda, your story has done so much for me and for that, I thank you. If anyone is reading this and debating on whether or not to read this book, I say go for it. It changed my life and it might change yours. Thank you Mama Hanna and Kristen for your heartfelt expressions regarding this book. I appreciate your visit to our blog and your sincere comments.